You’ve studied and now you’re geared up for the ACT math section (whoo!). But are you ready to take on the most challenging math questions the ACT has to offer? Do you want to know exactly why these questions are so hard and how best to go about solving them? If you’ve got your heart set on that perfect score (or you’re just really curious to see what the most difficult questions will be), then this is the guide for you. We’ve put together what we believe to be the most 21 most difficult questions the ACT has given to students in the past 10 years, with strategies and answer explanations for each. These are all real ACT math questions, so understanding and studying them is one of the best ways to improve your current ACT score and knock it out of the park on test day. Like all topic sections on the ACT, the ACT math section is one complete section that you will take all at once. It will always be the second section on the test and you will have 60 minutes to completed 60 questions. The way the ACT classifies “easy” and “difficult” is by how long it takes the average student to solve a problem as well as the percentage of students who answer the question correctly. The faster and more accurately the average student solves a problem, the “easier” it is. The longer it takes to solve a problem and the fewer people who answer it correctly, the more “difficult” the problem. All that being said, with very few exceptions, the most difficult ACT math problems will be clustered in the far end of the test. 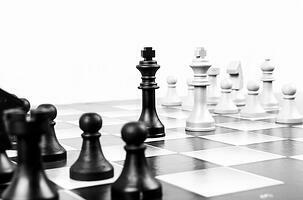 Besides just their placement on the test, these questions share a few other commonalities. We'll take a look at example questions and how to solve them and at what these types of questions have in commom, in just a moment. But First: Should You Be Focusing on the Hardest Math Questions Right Now? If you’re just getting started in your study prep, definitely stop and make some time to take a full practice test to gauge your current score level and percentile. The absolute best way to assess your current level is to simply take the ACT as if it were real, keeping strict timing and working straight through (we know—not the most thrilling way to spend four hours, but it will help tremendously in the long run). So print off one of the free ACT practice tests available online and then sit down to take it all at once. Once you’ve got a good idea of your current level and percentile ranking, you can set milestones and goals for your ultimate ACT score. If you’re currently scoring in the 0-16 or 17-24 range, your best best is to first check out our guides on using the key math strategies of plugging in numbers and plugging in answers to help get your score up to where you want it to. Only once you've practiced and successfully improved your scores on questions 1-40 should you start in trying to tackle the most difficult math problems on the test. If, however, you are already scoring a 25 or above and want to test your mettle for the real ACT, then definitely proceed to the rest of this guide. If you’re aiming for perfect (or close to), then you’ll need to know what the most difficult ACT math questions look like and how to solve them. And luckily, that’s exactly what we’re here for. Now that you're positive that you should be trying out these difficult math questions, let’s get right to it! The answers to these questions are in a separate section below, so you can go through them all at once without getting spoiled. #1: The equation we are given (−at2+bt+c) is a parabola and we are told to describe what happens when we change c (the y-intercept). 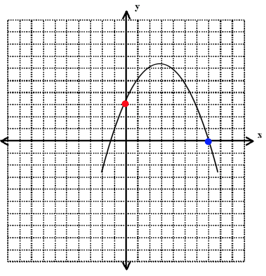 From what we know about functions and function translations, we know that changing the value of c will shift the entire parabola upwards or downwards, which will change not only the y-intercept (in this case called the “h intercept”), but also the maximum height of the parabola as well as its x-intercept (in this case called the t intercept). 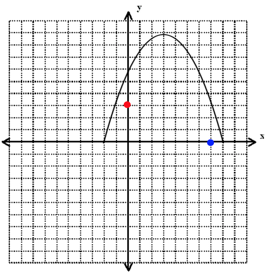 You can see this in action when we raise the value of the y-intercept of our parabola. Options I, II, and III are all correct. #2: First let us set up the equation we are told—that the product of c and 3 is b. Now we must isolate c so that we can add its value to 3. Finally, let us add this value to 3. #3: Because this question uses variables in both the problem and in the answer choices, you can always use PIN to solve it. 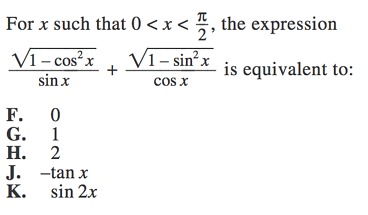 Simply assign a value for x and then find the corresponding answer in the answer choices. For this explanation, however, we’ll be using algebra. 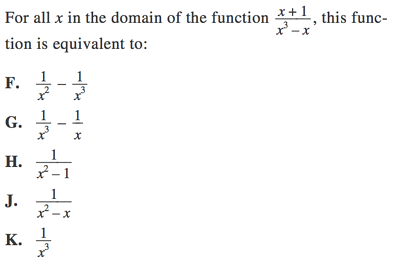 First, distribute out one of your x’s in the denominator. Now we can see that the (x2−1) can be further factored. We now have two expressions of (x+1), one on the numerator and one on the denominator, which means we can cancel them out and simply put 1 in the numerator. 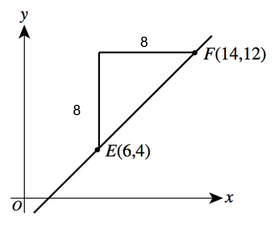 Our final answer is J, 1x2−x. #4: Before doing anything else, make sure you convert all your measurements into the same scale. Because we are working mainly with inches, convert the table with a 3 foot diameter into a table with a (3)(12)=(36) inch diameter. Our final answer is K, 48. 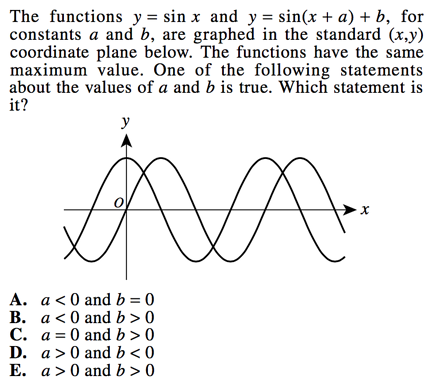 #5: The position of the a values (in front of the sine and cosine) means that they determine the amplitude (height) of the graphs. The larger the a value, the taller the amplitude. 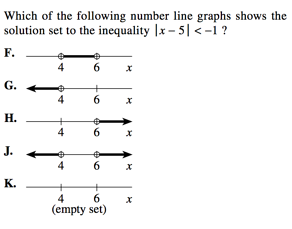 Since each graph has a height larger than 0, we can eliminate answer choices C, D, and E.
Our final answer is B, 0< a2< a1. #6: If you remember your trigonometry shortcuts, you know that 1−cos2x+cos2x=1. This means, then, that sin2x=1−cos2x (and that cos2x=1−sin2x). Our final answer is H, 2. #7: We know from working with nested functions that we must work inside out. So we must use the equation for the function g(x) as our input value for function f(x). 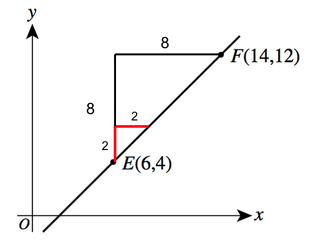 Now we know that this function passes through coordinates (4, 6), so let us replace our x and y values for these givens. (Remember: the name of the function—in this case f(g(x))—acts as our y value). Our final answer is A, b=8. Our final answer is J, 125. #9: Once we’ve slogged through the text of this question, we can see that we are essentially being asked to find the largest value of the square root of the sum of the squares of our coordinate points (x2+y2). So let us estimate what the coordinate points are of our z’s. Because we are working with squares, negatives are not a factor—we are looking for whichever point has the largest combination of coordinate point, since a negative square will be a positive. At a glance, the two points with the largest coordinates are z1 and z5. Our final answer is F, z1. #10: For a problem like this, you may not know what a rational number is, but you may still be able to solve it just by looking at whatever answer seems to fit with the others the least. Answer choices A, B, C, and D all produce non-integer values when we take their square root, but answer choice E is the exception. A rational number is any number that can be expressed as the fraction of two integers, and this is the only option that fits the definition. Or, if you don’t know what a rational number is, you can simply see that this is the only answer that produces integer values once we have taken the root, which makes it stand out from the crowd. #11: Because we are working with numbers in the triple digits, our numbers with at least one 0 will have that 0 in either the units digit or the tens digit (or both, though they will only be counted once). We know that our numbers are inclusive, so our first number will be 100, and will include every number from 100 though 109. That gives us 10 numbers so far. #12: First, turn our given equation for line q into proper slope-intercept form. Now, we are told that the angles the lines form are congruent. This means that the slopes of the lines will be opposites of one another [Note: perpendicular lines have opposite reciprocal slopes, so do NOT get these concepts confused!]. 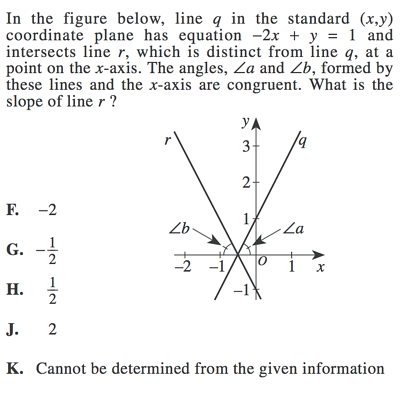 Since we have already established that the slope of line q is 2, line r must have a slope of -2. 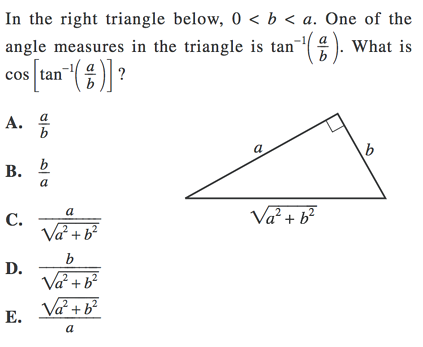 #13: If you remember your trigonometry rules, you know that tan−1(ab) is the same as saying tanΘ=ab. Knowing our mnemonic device SOH, CAH, TOA, we know that tan Θ = opposite/adjacent. If a is our opposite and b is our adjacent, this means that Θ will be our right-most angle. #14: By far the easiest way to solve this question is to use PIN and simply pick a number for our x and find its corresponding y value. After which, we can test out our answer choices to find the right one. Now let us test out our answer choices. At a glance, we can see that answer choices H and J would be positive and answer choice K is 0. We can therefore eliminate them all. We can also see that (t−u) would be negative, but (u−t) would not be, so it is likely that F is our answer. Let us test it fully to be sure. 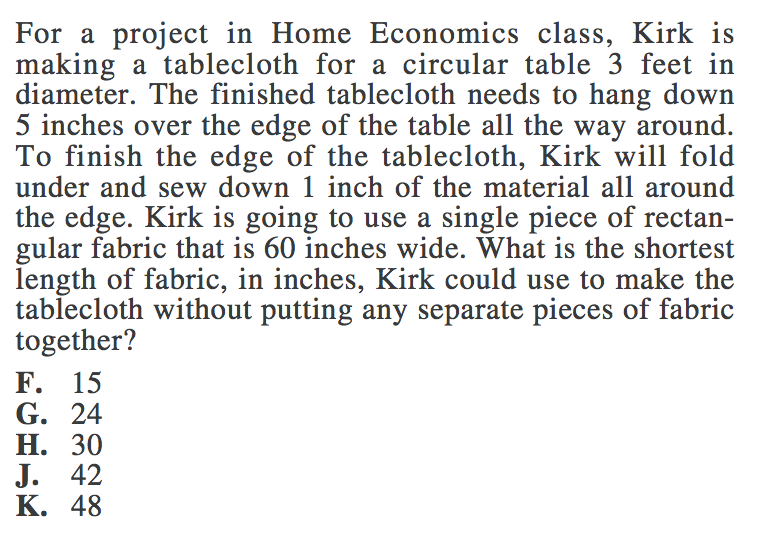 #15: In a question like this, the only way to answer it is to go through our answer choices one by one. 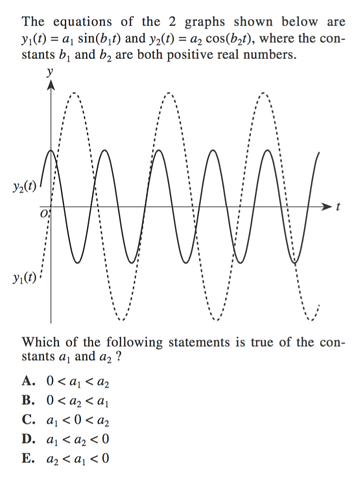 Answer choice A would never be true, since y<−1. Since x is positive, the fraction would always be positivenegative, which would give us a negative value. 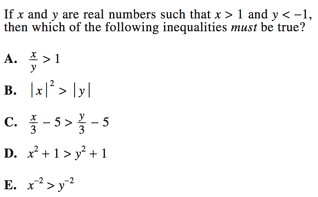 Answer choice B is not always correct, since we might have a small x value (e.g., x=3) and a very large negative value for y (e.g., y=−100). In this case, |x|2 would be less than |y|. Answer choice C is indeed always true, since apositivenumber3−5 may or may not be a positive number, but it will still always be larger than anegativenumber3−5, which will only get more and more negative. We have found our answer and can stop here. #16: We are told that there is only one possible value for x in our quadratic equation x2+mx+n, which means that, when we factor our equation, we must produce a square. We also know that our values for x will always be the opposite as the values inside the factor. (For example, if our factoring gave us (x+2)(x−5), our values for x would be -2 and +5). The m in our equation stands in place of the 6, which means that m=6. Our final answer is C, 6. #17: The simplest way to solve this problem (and the key way to avoid making mistakes with the algebra) is to simply plug in your own numbers for a, r and y. If we keep it simple, let us say that the loan amount a is 100 dollars, the interest rate r is 0.1, and the length of the loan is 2 years. Now we can find our initial p.
When we doubled our a value, our p value also doubled. 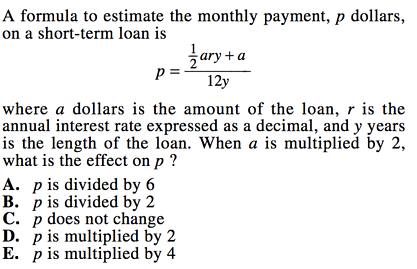 Our final answer is D, p is multiplied by 2. #18: If we were to make a right triangle out of our diagram, we can see that we would have a triangle with leg lengths of 8 and 8, making this an isosceles right triangle. 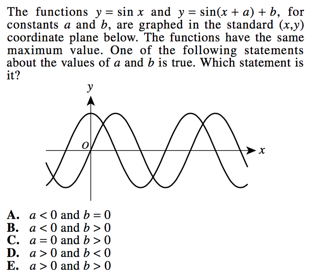 #20: The only difference between our function graphs is a horizontal shift, which means that our b value (which would determine the vertical shift of a sine graph) must be 0. 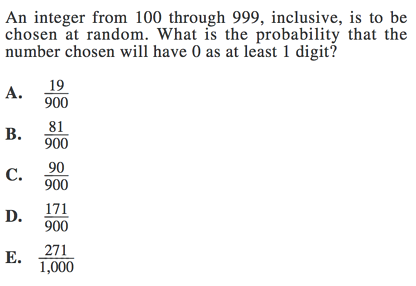 Just by using this information, we can eliminate every answer choice but A, as that is the only answer with b=0. For expediency's sake, we can stop here. 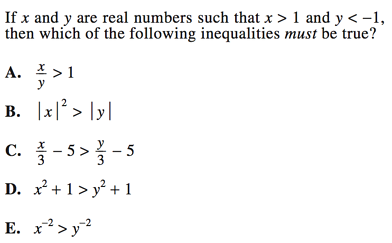 #21: You may be tempted to solve this absolute value inequality question as normal, by making two calculations and then solving as a single variable equation. (For more information on this, check out our guide covering absolute value equations). In this case, however, pay attention to the fact that our absolute value must supposedly be less than a negative number. An absolute value will always be positive (as it is a measure of distance and there is no such thing as a negative distance). This means it would be literally impossible to have an absolute value equation be less than -1. Our final answer is K, the empty set, as no number fulfills this equation. Whoo! 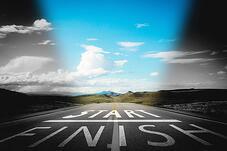 You made it to the finish line—go you! What Do the Hardest ACT Math Questions Have in Common? 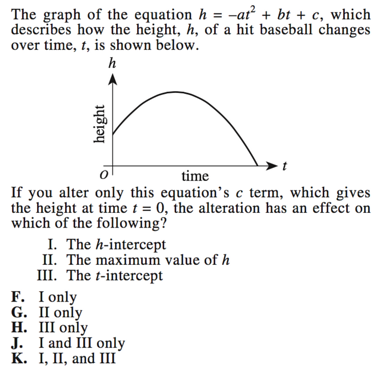 Now, lastly, before we get to the questions themselves, it is important to understand what makes these hard questions “hard.” By doing so, you will be able to both understand and solve similar questions when you see them on test day, as well as have a better strategy for identifying and correcting your previous ACT math errors. In this section, we will look at what these questions have in common and give examples for each type. In the next section, we will give you all 21 of the most difficult questions as well as answer explanations for each question, including the ones we use as examples here. 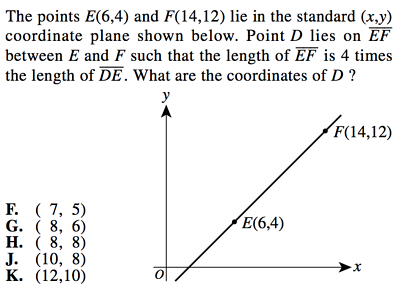 As you can see, this question deals with a combination of functions and coordinate geometry points. 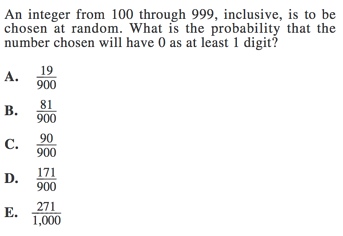 Though it may sound like a simple probability question, you must run through a long list of numbers with 0 as a digit. This leaves room for calculation errors along the way. Another reason the questions we picked are so difficult for many students is that they focus on subjects you likely have limited familiarity with. For example, many students are less familiar with algebraic and/or trigonometric functions than they are with fractions and percentages, so most function questions are considered “high difficulty” problems. 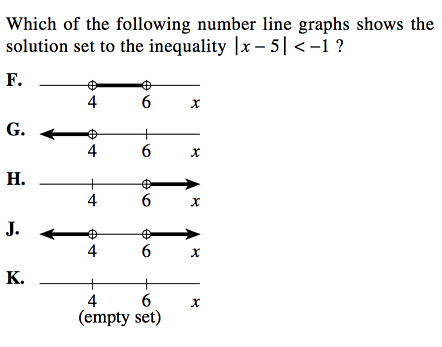 Many students get intimidated with function problems because they lack familiarity with these types of questions. 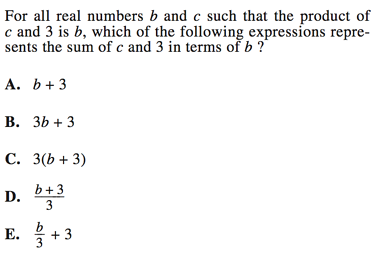 Some of the most difficult ACT questions are not so much mathematically difficult as they are simply tough to decode. Especially as you near the end of the math section, it can be easy to get tired and misread or misunderstand exactly what the question is even asking you to find. This question presents students with a completely foreign mathematical concept and can eat up the limited available time. Remember—if a question is located at the very end of the math section, it means that a lot of students will likely make mistakes on it. Look out for these questions, which may give a false appearance of being easy in order to lure you into falling for bait answers. Be careful! 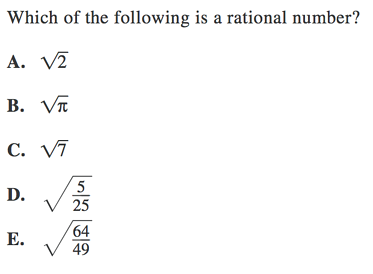 This question may seem easy, but, because of how it is presented, many students will fall for one of the bait answers. Working with hypothetical scenarios and variables is almost always more challenging than working with numbers. 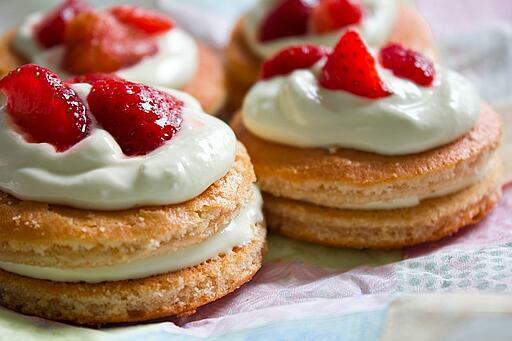 Now picture something delicious and sooth your mind as a reward for all that hard work. 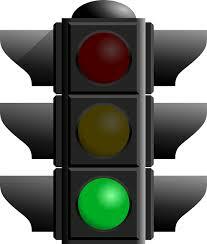 Taking the ACT is a long journey; the more you get acclimated to it ahead of time, the better you'll feel on test day. And knowing how to handle the hardest questions the test-makers have ever given will make taking your ACT seem a lot less daunting. If you felt that these questions were easy, make sure not underestimate the effect of adrenaline and fatigue on your ability to solve your math problems. As you study, try to follow the timing guidelines (an average of one minute per ACT math question) and try to take full tests whenever possible. This is the best way to recreate the actual testing environment so that you can prepare for the real deal. 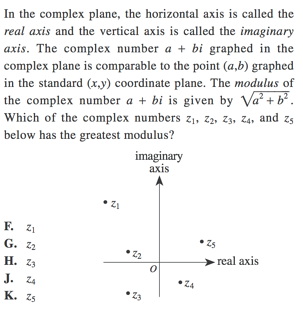 If you felt these questions were challenging, be sure to strengthen your math knowledge by checking out our individual math topic guides for the ACT. 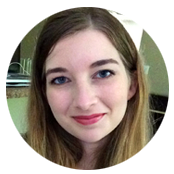 There, you'll see more detailed explanations of the topics in question as well as more detailed answer breakdowns. Felt that these questions were harder than you were expecting? Take a look at all the topics covered on the ACT math section and then note which sections you had particular difficulty in. Next, take a look at our individual math guides to help you strengthen any of those weak areas. Running out of time on the ACT math section? Our guide to helping you beat the clock will help you finish those math questions on time. Aiming for a perfect score? 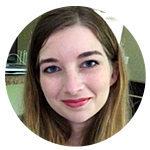 Check out our guide on how to get a perfect 36 on the ACT math section, written by a perfect-scorer.